Serowe is a place where tradition meets modernity. The dire consequences of the HIV/AIDS pandemic that haunt the region continue to be the foremost social concern. With a population of almost 100,000, Serowe is one of the biggest village type settlements in Botswana and in Sub-Saharan Africa. It has a traditional as well as a modern leadership structure and functions as a centre for commerce and trade in the central region of Botswana. Due to its location in a well-watered part of Botswana, farming and livestock rearing form the livelihood basis for the majority of people in the area. A family structure where the extended family plays an important role has long been prominent in Serowe. This means that orphaned children or ill relatives are usually taken in and cared for by the extended family. Slowly though, things have started to change as more and more people move away from the village in search of a job. However, the biggest strain on the extended family care model in Serowe is the devastating effect of HIV/AIDS, as families lose breadwinners and children lose parents. Initiatives by the government and local authorities in Serowe have come a long way in battling the effects of the HIV/AIDS pandemic. But the sheer number of HIV/AIDS affected people and the resulting high number of orphans make it crucial to expand and strengthen existing social infrastructures in the Serowe area. Providing HIV/AIDS affected families and other vulnerable families with medical care and food support are only the first steps on the way to truly making a difference in the lives of vulnerable children. It is essential for these children to receive psychosocial support so they can cope with the illness and death of parents, and this kind of support is not widely accessible in Serowe. The importance of education is an issue that needs to be better communicated in the community. Grandparents are often the only ones left to care for orphans, and since many of them are illiterate themselves, they see little or no reason to motivate the children to attend school. Important social challenges continue to be education on HIV/AIDS related issues and efforts to battle the stigmatisation that is still commonly associated with being HIV/AIDS affected. Families who depend on support also experience stigmatisation. Possibly the hardest challenge to overcome is to ensure that a growing number of orphans and vulnerable children receive adequate care and the psychosocial support they need so that they can experience carefree moments of just being a child. Children also need the opportunity to acquire skills that can later help them to become independent adults. Care in families: Up to 120 children can find a loving home in twelve SOS families, which have been helping vulnerable children in Serowe since 2008. Some of these families live in houses that are integrated in the community. Here, the children grow up in families together with siblings, under the care of an SOS mother and the support of SOS social workers. A development plan is made for each child, ensuring access to education or vocational training. Support for young people: As the children in our care grow older, an SOS Youth Programme will be developed in Serowe according to need. Such a programme typically includes housing where the young people can live together under the supervision of an SOS counsellor. 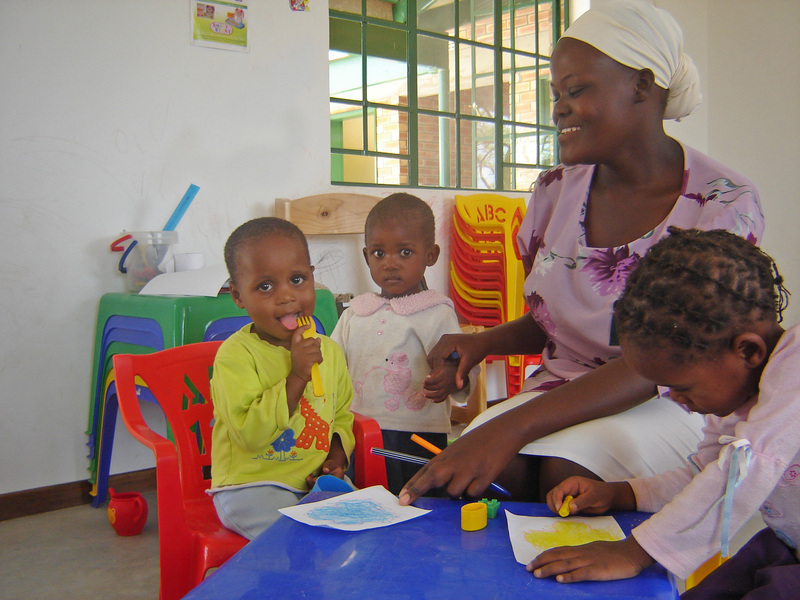 Education: SOS Children’s Villages also runs a kindergarten in Serowe which provides day-care for as many as 100 children from SOS families as well as from the local community. Under the care of professional staff, the children can experience playful moments while learning valuable inter-social skills. The children are also prepared for starting school. Many activities are arranged by SOS Children’s Village Serowe such as camps and visits to local sights, so that the children can build skills and gain knowledge that will help them later in life. Much attention is also devoted to the psychosocial needs of the children, so that they may overcome possible traumas and be given the chance to experience just being a child.